Gloucester offers a great range of interests because of its natural beauty. It has a friendly, country lifestyle with access to services including medical, education and shopping. 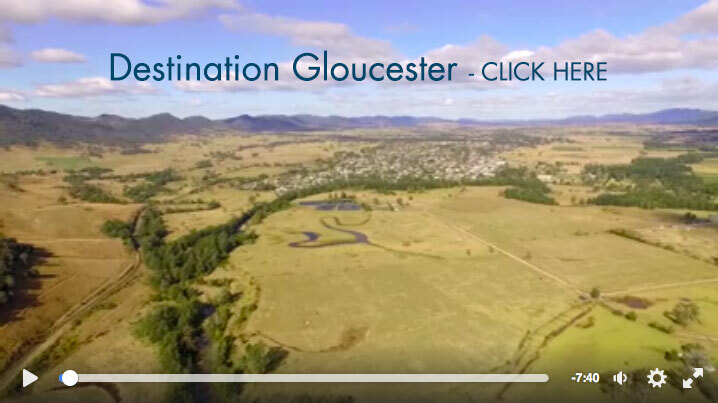 Gloucester offers value for money compared to other parts of the Hunter to prospective home buyers and investors. The median house price for an existing home is $260,000 and renting a 3-bedroom house will cost $290 p/w. There are a large number of hobby or life-style farms in the Shire. This is primarily the result of retirees moving to the area because of its attractive climate, scenery and location. Gloucester Shire contains three State primary schools, one Catholic primary school and one State High School. TAFE Campuses are located in Taree, Tuncurry and Newcastle. Two pre-schools, OOSH and the University of Newcastle complete the education facilities. Gloucester Soldiers Memorial Hospital provides health servicing, with doctors and health professionals also on offer at a purpose built medical centre with visiting specialists. Gloucester also has significant sports and recreational facilities to cater for all types of indoor and outdoor activities. The Olympic Pool is open from October to April and the Hydrotherapy Pool is open all year round. Gloucester District Park is an easy stroll from the main street, with beautiful gardens, tennis courts, skate park, barbeque facilities, play equipment, Minimbah Bush Tucker Garden to name but a few, and don't forget you can stroll along the beautiful Gloucester River, there is so much to see and do. Just about every sport is catered for here from archery to tennis and everything in between. There are over 160 groups in our Shire, from service clubs to sports, arts, craft and more, you will find something to interest everyone. Dining experiences offered in Gloucester are many, from gourmet coffee to a la carte. Several cafes and takeaway shops can be found in the town centre with restaurants operating from the Bucketts Way Motel,Soldiers Club, Bowling Club as well as the Country Club, as well as hotel dining at the Avon Valley and Roundabout Inns. Professional services are readily available in Gloucester and include; Accountants, IT Sales and Service, Insurance Providers, Solicitors, Surveyors and Travel Consultants. 80 bed facility that offers a 20 bed acute ward, 15 bed aged care transitional ward, 25 bed nursing home and a 20 bed hostel. 24 hour emergency department, medical, surgical, palliative care, limited obstetrics, limited paediatrics, x-ray and physiotherapy. Minor general surgery, ophthalmic (eye) surgery is also undertaken here. • Average minimum temperature - 10.5 degrees Celsius. Highest temperatures occur generally in December, January, February, when the average maximum is around 30 degrees Celsius. Department of Family and Community Services (formerly Housing NSW), Rent and Sales Report, Issue 114, Rent:December Quarter 2015, Sales: September Quarter 2015.